What is a WooCommerce product table? 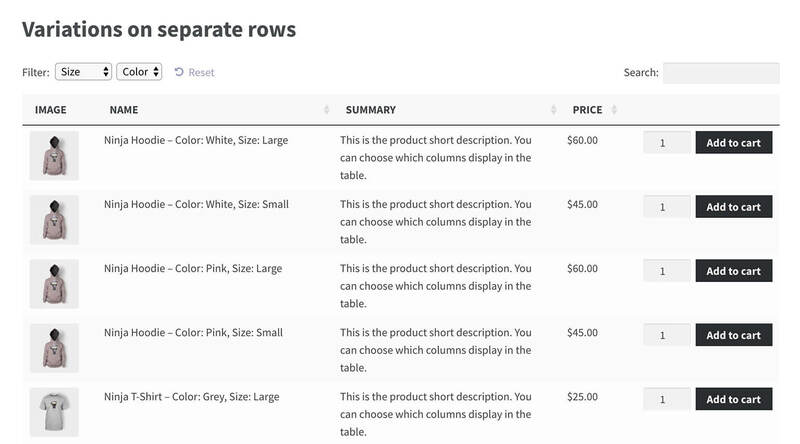 A WooCommerce product tables lists products in a structured table layout. This will consist of rows and columns, with each product as a separate row in the table. 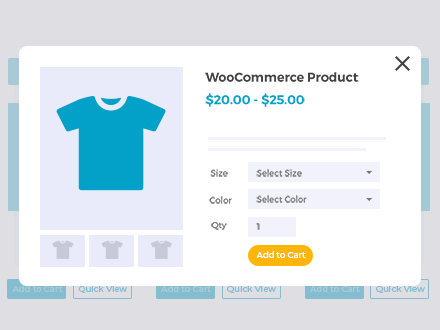 The WooCommerce Product Table plugin is the easiest way to create a table view for your store. It comes with dozens of options, and saves having to code complex table layouts from scratch. Product tables sound simple, but they provide lots of opportunities to optimise your WooCommerce conversion rate. 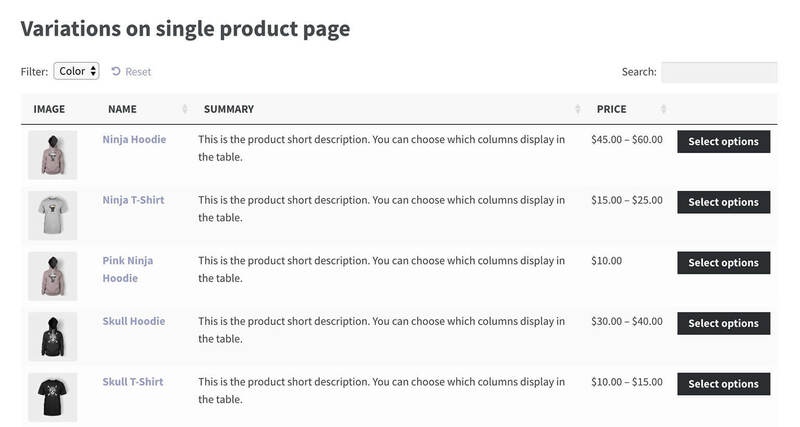 Read on to discover how to get more sales by listing products in a table layout. Increase conversions and get more sales on your WooCommerce site today! Most store owners don’t stop to consider what product data to include on the WooCommerce shop pages. Big mistake! WooCommerce and your theme will display pre-defined information on the shop and category pages. This typically includes the product image, title, price, ratings and add to cart button. But what if this isn’t the data that will convince your customers to buy? 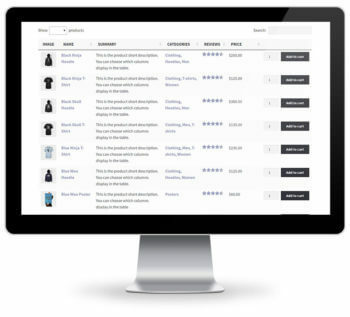 WooCommerce Product Table lets you choose exactly what data to provide on product listing pages. Each piece of information is displayed as a column in the product table. The plugin supports all the standard product data such as SKU, name, short and full description, categories, tags, featured image, reviews, stock, size, and price. If this isn’t enough, you can also show custom product data by creating custom fields and taxonomies. With so many possible columns, you have full control over the product information in the table. Think carefully about what data your customers need to see on each page. If your product tables have links to the single product page, the aim is to provide enough information to inspire customers to click through and learn more. If your WooCommerce tables include add to cart buttons, they’ll need to include enough data to decide to buy without clicking elsewhere. Don’t just add columns to your WooCommerce product tables because you can. Think carefully about all the available columns. Only use the ones that will actively convince customers to buy your products. 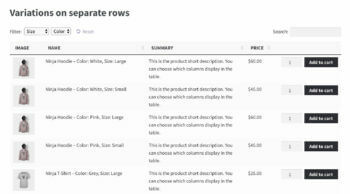 A WooCommerce wholesale order form might use product tables to show as many products as possible per page. Wholesale customers already know what they want to order, so they don’t need images or descriptions. The product table will therefore contain columns with factual data such as SKU or ID, name, attributes, and multi-select checkboxes. 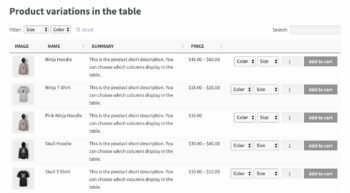 A WooCommerce restaurant order system might use product tables with a small image of each dish, plus columns for name, short description, price, and add to cart buttons. It might also include custom fields and taxonomy to show extra information such as calorie count and meat-free labels. See the knowledge base for a list of all the product data you can show in the WooCommerce table layout. The great thing about WooCommerce product tables is that you have full control over the images. Most WooCommerce themes display product images in a standard size. This may not present your products in a way that will show them off and maximise conversions. When creating product tables, think about what image size will sell your products most effectively. Do you need product images at all? Lots of WooCommerce websites upload an image for each product, just because the theme expects them to. This leads to some strange results, such as huge images to promote non-visual products such as e-books. Think about whether images will attract customers to your products, or whether they’d prefer a text-based layout with more products per page. How big should the images be? Again, most WooCommerce stores use big images because the theme automatically sizes them. Images take up a lot of space and reduce the number of products that will fit on each page. Only use big images if they actively help to sell your product. Many types of product will benefit from an image, but a small thumbnail is enough. For example, a WooCommerce website selling spare automobile parts need product images to reassure customers that it’s the right part. However, customers aren’t buying based on what the part actually looks like, so it’s best to keep the images small. What about the image proportions? The most popular WooCommerce themes require square images. This may not be ideal, for example if you’re selling a tall and thin product such as clothes. By listing products in a WooCommerce table layout, you can choose whether or not to include an image column. 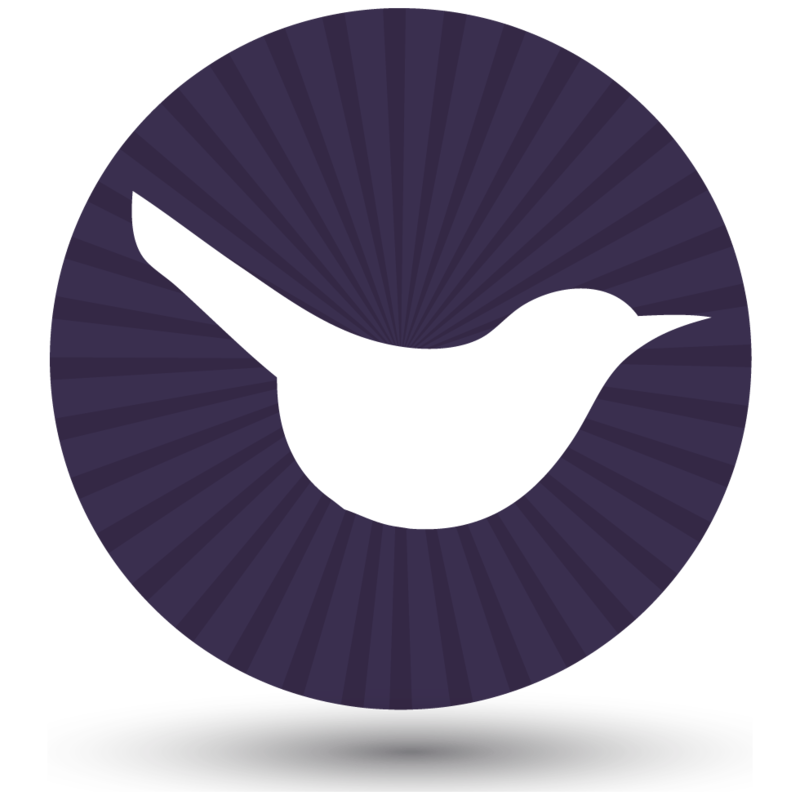 If you add featured images, you have full control over the image size and dimensions. This is an opportunity to improve WooCommerce conversion rates by making your images more appropriate and ensuring they will actively sell your products. Experiment with the image size option to get the perfect balance to sell your products. Try to achieve a balance between creating images that will make customers want to buy, and fitting the optimal number of products onto each page. ‘Add to cart’ button for each product. Multi-select checkbox to add multiple products to the cart. Use the add to cart button and checkbox together, giving customers a choice. Perhaps you want customers to buy on the single product page instead of directly from the table. You can include a button linking to the single product page instead of (or as well as) having add to cart buttons. First, you need to decide whether add to cart buttons will help or hurt your WooCommerce conversion rate optimisation. There’s no one-size-fits-all answer to this question. It depends on the type of products you sell, and how much information your customers need to convince them to buy. Do you sell high value products, where customers spend a long time reading and researching before deciding to purchase? If so, it’s often best not to include add to cart buttons in your product table at all. Instead, add a ‘Details’ button linking to the single product page. Or don’t bother with buttons at all, as customers can click on the title to access the product details. Once customers click through to view more information, they can spend more time reading full details, reviews, and other data that will convince them to buy. They will only click the ‘Add to cart’ button after they have read all the information, so there’s no point including them in the product table view. Do you want to disable online ordering, with different calls to action? This article is about optimising your WooCommerce conversion rate. However, conversions don’t have to be online sales. You might sell your products offline, for example via phone or in person. If this is you, then you can create a product table without add to cart buttons. You can disable all the links in the table so that customers can’t click through to the single product page at all. Instead, create a custom field with a different call to action – for example, a ‘Call us now’ button. Show this as a column in the product table, encouraging customers to do whatever action counts as a conversion for you. And what about multiple purchases? Do customers buy one product at a time? If customers are likely to order single products only, then the best option is a single add to cart button for each product in the table. For example, if you’re selling hot tubs then customers will only ever buy one, so there’s no need for multi-select boxes. Do you want customers to buy several different products? Lots of WooCommerce stores want customers to buy as many products as possible. This applies to all sorts of store including clothing websites, online food ordering systems for restaurants, and shops selling low-value products such as stationery. If this is you, then you can vastly increase your income by taking steps to increase the average order value. It’s more profitable to increase your average order value than to attract more low value customers – for example, because it reduces advertising and support costs. Multi-select checkboxes are a great way to do this. Customers can quickly tick all the products they want, and add them all to their basket in a single click. Nice! If your product tables have add to cart buttons, then it might also be worth adding a quantity selector. This is always worth doing if you want customers to buy more than one of each product. For example, if you’re selling pens then having ‘add to cart’ buttons without a quantity picker will encourage customers to buy one pen at a time. This isn’t what you want! In contrast, adding a quantity selector will unconsciously prompt customers to stock up and buy more. This is another great way to increase the average order value, which can hugely increase your revenue. #4 – Should the product table link to the single product page? We’ve already touched on this, but let’s delve deeper into the question of whether to use the single product page. The great thing about WooCommerce Product Table is that you can choose whether or not to have a separate ‘Details’ page for each product. By default, customers can click on any product in the WooCommerce table to access the product details page. If you like, you can also add buttons linking to the product pages. This is ideal if customers will want to see more information about your products than you can include in the table. However, not all stores will benefit from using the single product page. WooCommerce quick order forms simplify the buying process by keeping everything on the product table page. There’s no need for customers to click through to separate pages. Read-only product catalogues provide information about each product, without an option to buy. The single product page includes Buy buttons, so you may want to remove access to these pages. WooCommerce wholesale stores are for regular trade customers who already know what they want. They want to order quickly from the wholesale order form, without having to click elsewhere. To stop customers accessing the product details page, you can disable these links in the product table. When they view the products in the table, the only action they can take is to buy! Do you sell product options or variations? WooCommerce Product Table fully supports variable products, and add-ons creating using the WooCommerce Product Add-Ons plugin. Think about which option will maximise your WooCommerce conversion rate optimisation. Again, different types of store will benefit from presenting variations and add-ons in different ways. Show variations as dropdown lists if you have lots of products. The dropdowns let you save space by listing as many products as possible per page. List variations on separate rows if you have a small number of products and want to draw more attention to each variation. For instance, you might sell a single product but offer it in several variations. The best way to sell this product using a table view is to list each variation as a separate row in the table. Use add-ons if the logic of variations doesn’t meet your needs – for example, if you want customers to be able to select multiple options. Research shows that almost 70% of customers read reviews before making a purchase, and having customer reviews on your website can increase conversions by nearly 75%. This highlights the power of social proof as a tool for WooCommerce conversion rate optimisation. Product reviews – Include a ‘Reviews’ column in the product table. This is built into the table plugin and shows each product’s average star rating. Customers can click to read full reviews on the single product page. Product audio & video reviews – Word of mouth is the best sales tool. Leverage this by adding audio or video testimonials from happy customers, with embedded players in the product table. People can click the ‘Play’ button to watch or listen to customers talking about why they should buy each product. What better way to convince them to buy? With WooCommerce Product Table, you can think of exciting new ways to bring your products to life. This can have a big impact on your conversion rate. You can be really inventive here, as the WooCommerce table plugin supports shortcodes from your theme and other plugins. This means that you can add content provided by other shortcodes and display them in the product table. For example, you might have promotional videos or 360 degree tours to promote your products. You can embed them directly in the product table. Customers can see the product in action without having to click elsewhere. So far, we’ve looked at some conversion-winning ways to display products with WooCommerce Product Table. That’s all well and good, but your sales will only increase if it’s quick and easy for customers to find the products they want in the table. If customers have to scroll through lots of products to find what they’re looking for, they’ll quickly give up and look elsewhere. This increases your bounce rates and reduces conversions. To get the most benefit from your product tables, you need to design them in a way that makes it super-easy for customers to find products. If you only have a few products, this isn’t really an issue. But if you have a large product catalog, then it becomes incredibly important. How many product tables do you need? First, decide how many product tables you need. You can list your entire inventory in a single product table. Or, you can create multiple tables, each containing different products. 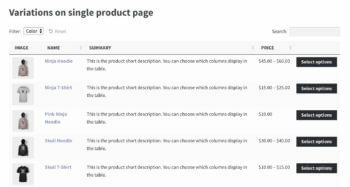 Multiple product tables on a single page – One option is to divide up a single page with multiple product tables. For example, a WooCommerce restaurant might create a single page for ordering their foods online. They would structure the page with a heading for each section of their menu (Starters, Main Courses, etc. ), followed by a product table listing foods from that category. Alternatively, they can create a tabbed layout or accordion with a product table in each section. Customers can select their foods and place an order from this one-page order form. Product tables on separate pages – Alternatively, you can add product tables to different pages across your site. 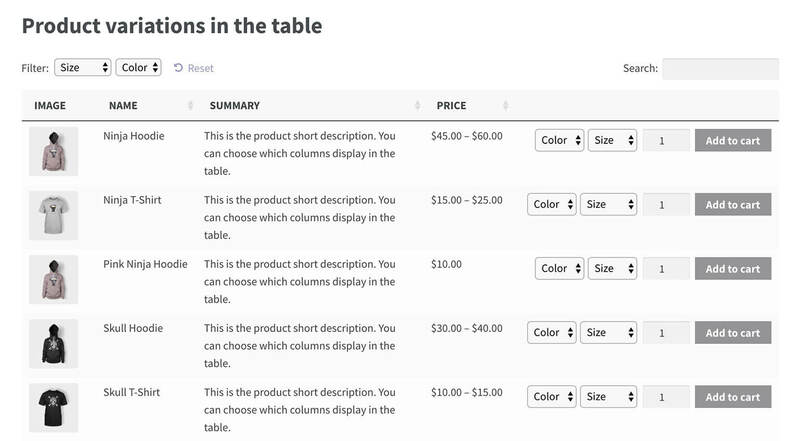 The tables might replace your standard WooCommerce product category page layout. Customers can navigate between pages via the navigation menu, sidebar links and other internal links. How will customers search, sort and filter the WooCommerce table? WooCommerce Product Table comes with lots of ways to help customers find products in the table. To optimise your WooCommerce conversion rate, don’t just activate them all! Think about the number of products in the table and how customers will use it. Armed with this knowledge, you can add search and filter options that will be most useful to your customers. First, think about whether you need to make it easier to find products. If you only have a few products, then there’s no need to clutter up the table with a search box or filters. Instead, keep it minimal – this draws more attention to your products. If you have lots of products, then you can definitely improve your WooCommerce conversion rate by adding extra search and filter options. Sort columns – Customers can click on any column to sort the table by that column. The sort arrows appear automatically and make it easier for your customers. You can also change the default sort order for when the WooCommerce table first loads. Keyword search box – By default, a search box appears above the table. There are options to hide or reposition this. Keep it if customers might want to search for a product by typing a particular keyword. For example, this can be a life-safer if customers already know the name, ID or SKU of the product they’re looking for. Filter dropdowns – You can show filter dropdowns above the table to let customers filter by category, tag, attributes, variations, etc. 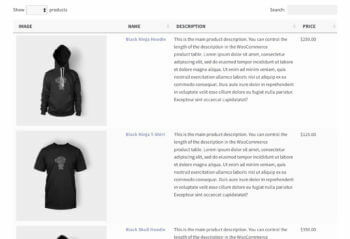 WooCommerce filter widgets – The product table plugin comes with its own version of the built-in WooCommerce filter widgets. 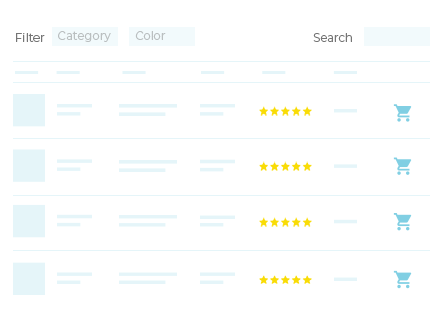 These let you filter the table by selecting a product attribute, price, or rating in the sidebar. WooCommerce Product Table is responsive and mobile-friendly straight out of the box. Resize your browser to see the table resize before your eyes. Even so, you can take further steps to increase your WooCommerce conversion rate for mobile users. This is definitely worth doing, as most stores have higher bounce rates for mobile users. It’s more of a challenge to create a good buying experience on mobiles compared to larger screens. By default, the WooCommerce table plugin will automatically prioritise which columns are visible on mobiles. If you have too many columns to fit onto smaller screen sizes, then some columns will be hidden. Customers can click a small cross icon to view the hidden columns. Priorities – Choose which columns are visible and which are hidden on mobiles. Use this option to make sure the most important columns are always visible, such as the product name and add to cart buttons. Responsive Display – Choose what happens when not all the data in the table will fit on the screen. Instead of hiding columns behind the cross icon, you can show it all by default, or let it appear in a modal window. By perfecting your store’s user-experience on mobiles, you can optimise your WooCommerce conversion rates for mobile users and get more sales. If you’re making improvements designed to increase conversion rates, it’s important to make sure they actually work! Conversion tracking lets you monitor your conversions in an evidence-based way. Make each improvement one at a time, and track the impact on your WooCommerce conversion rate. Use this information to do more of what works best, and less of what doesn’t. Google Analytics is the best tool to track conversions in WooCommerce. You can easily set it up using a free WordPress plugin such as WooCommerce Conversion Tracking. Once it’s in place, check your Google Analytics regularly. Dive into the data and learn about where your best referrals come from, who your best customers are, and much more. You’ll also want to discover how the product tables are affecting your WooCommerce conversion rate. By default, Google Analytics doesn’t record data about changes you make to your website. However, you can use a little-known option to record the improvements you make, and view them alongside the conversion rate tracking data. Go to any screen in Google Analytics that has an Overview chart (similar to the line graph shown below). Click on the tiny up arrow underneath the chart. Select the date when you made each change to your website (e.g. adding product tables), and add some text describing the change. Remember to create an annotation every time you do something that might affect your conversion rate optimisation. The date of each animation will appear as a dot on the chart. When you’re viewing your WooCommerce conversion rate data, if there are any major changes in the graph then you can easily see which change/annotation they were caused by. For example, adding product tables should increase your WooCommerce conversion rate. If you see a sudden spike in the conversion rate tracking chart, you can easily see if it happened after you added the product tables. 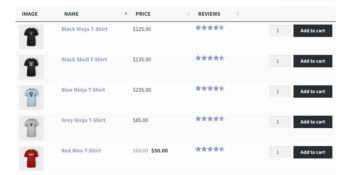 As you can see from my top 10 tips, product tables are a fabulous way to convert more customers into paying customers. In many ways, it boils down to using one-page shopping as an alternative to sending customers to a separate page for each product. This in turn speeds up the buying process and encourages customers to buy multiple products at once. But what happens if your customers need more information than you can fit into the product table layout? Sure, you can add extra columns to show information in the table view. However, some types of product do need extra information. Or they may have too many variations to fit into one-page shopping. So how do you provide extra information without requiring extra page loads? The answer is to add WooCommerce quick view to your product tables. 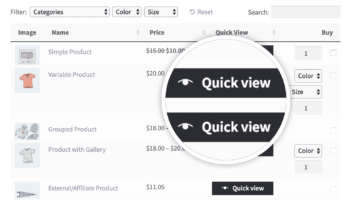 The Quick View Pro plugin adds quick view buttons or links to WooCommerce Product Table. Customers use these to view the full product image gallery and read extra information such as the short description in a lightbox popup. They can even choose variations, quantities and add to the cart directly from the lightbox. This is the perfect way to provide extra product details without taking customers away from the product table page. Customers remain on the list of products throughout the process, offering true one-page shopping with an extra boost. The quick and easy way to show extra product information and boost conversions. It’s time to optimise your WooCommerce conversion rate! Conversion rate optimisation is a cost-effective way to invest in improving the success of your store. With a bit of time and the cost of a plugin, you can see an immediate increase in your sales which will continue well into the future. The amazing thing about improving the conversion rate is that you can increase your WooCommerce store’s revenue without spending any extra on marketing or customer acquisition. If you’re already getting a decent amount of traffic, then conversion rate optimisation increases your sales for very little effort. As you’ve seen, WooCommerce product tables provide lots of opportunities to increase conversions. Of course, you’ll see the greatest success if you combine WooCommerce conversion rate optimisation with other ways to increase revenue. Make sure nothing else is putting customers off buying from you. For example, is your pricing competitive? You need to ensure that each part of the buying process will maximise your sales. Product tables will convince customers to buy your products, but don’t forget about optimising your cart and checkout too. Here’s a link to a comprehensive guide on how to optimize your cart and checkout based on real human behavior. Kinsta have also published a definitive guide to boosting your WooCommerce store sales. Whatever your conversion rate, you’ll make more sales if you get more relevant traffic to your site. Check out our WooCommerce SEO packages for help with this. If you like the WooCommerce table plugin, you can earn 30% commission by becoming an affiliate and recommending it! To start increasing your WooCommerce store revenue, get WooCommerce Product Table today and follow the tips in this article. Combine it with excellent products at the right prices, and enjoy healthy sales well into the future. Hello Sir, this article is very good. Hey Katie! awesome article and I'm glad I'm not the only one who absolutely lOVES Woo product tables! Even on mobile, with a few tweaks they really do make a difference on stores with tons of products. Apparently no plugin for woocommerce? Sorry Ty, what do you mean about no plugin for WooCommerce? The plugin is about WooCommerce Product Table which works with WooCommerce.